Summer’s fully here, with 31° over the past few days and lots and lots of sunshine. The flat’s been super hot, so all windows have been left open to create some sort of draft and ease the heat. When it’s hot like that I tend to not eat much. Ice cream cravings do hit me quite regularly (as in every minute), but our freezer’s full to the brim with Thai curries and Morrocan Tagines, petit pois and bread, no space for sweet indulgence. So I’ve been looking for some summery dishes. But the obvious salads soon became boring and I was looking for new inspiration. Browsing the bookshelves of a discount bookstore with Sian was the perfect occasion. Sian was looking to buy her first ever cookbook! A total honour she chose me to join this significant milestone. I absolutely love the reason why Sian decided to take the plunge into the cookery book world: because of Norwegian Wood! Do you remember that one of the characters decided to learn cooking by buying a cookbook and just cooking every dish in it?! Me neither! So glad Sian refreshed my memory. I was about to buy a Korean cookery book (I’m addicted to Kimchi and mad about Bibimbap), when Sian pulled Rachel Allen ‘Home Cooking’ off the shelf. It was discounted from £25 to £8. The pictures are absolutely lovely, so is the feel of the pages, and the cute little star and polka dot patterns that they use as wallpapers behind the recipes. It actually looks a bit like I imagine my cookbook to be one day. Absolutely lovely. I had to get it for my (worryingly increasing) cookbook selection. I decided to go with the bread (Guardian), and keep the spring onions (Allen) and add lots of tabasco (me). Be warned that the recipe looks quicker than it actually is. The pushing liquid through a sieve takes ages and lots of patience! And then once it’s done you need to actually chill the soup. So, make sure to prepare it well in advance before you want to eat it. I think next time I’d add a splash of white wine to it too (omitting the Vodka), but since I am planning to take the Gazpacho in my lunchbox to work, I doubt that wine would be a great idea (neither is Vodka! So, I’ve just added it in the single bowls in the end, leaving it out for the work lunchbox, obviously!). As for toppings: anything goes. I’ve used eggs and olives, since I had both in the fridge. You could sprinkle croutons on it (fry some bread cubes in olive oil with rosemary), or some crunchy pancetta or bacon, goats cheese or blue cheese, watercress, basil. The possibilities are endless! Anyway, this morning, on the post-Gazpacho-day, I woke up to a grey sky and a cold draft coming through my bedroom window. Well, looks like summer’s over again in good ol’ England, and we’re back to miserable skies and raindrops. Dice the bread and soak in water for 20 minutes. Quarter the tomatoes and blend in a blender until smooth. Push the mix through a fine sieve into a big bowl, always a little portion at a time, discarding the pulp after. Deseed the pepper and chop roughly. Trim the cucumber and chop roughly, do the same with the spring onions. Peel the garlic and chop roughly. 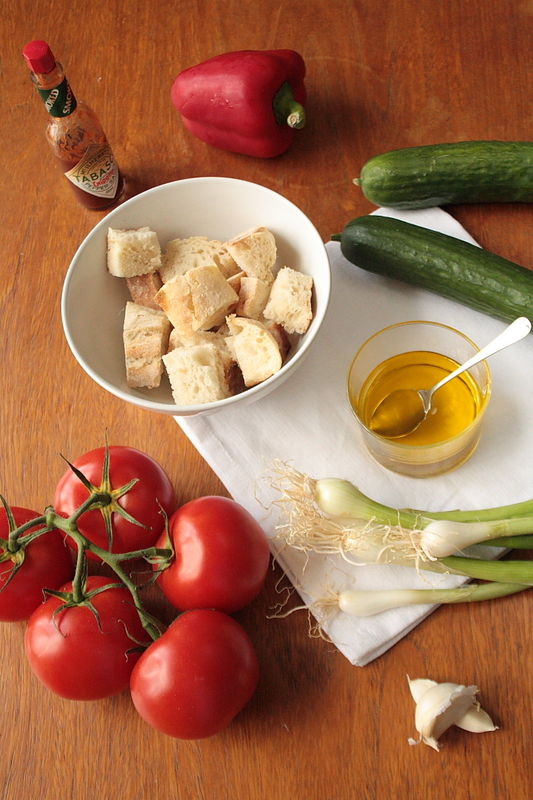 Put all these ingredients into the blender, and add the olive oil, seasoning to it. Squeeze out the liquid from the bread and add the bread into the blender too. Blend until smooth and push through the sieve into the tomato mix. Mix the soup well and taste, adding seasoning if needed. Now put it into the fridge for about an hour until thoroughly chilled. Prepare the topping. Chop the olives and egg finely, scatter over the soup and round it off with a few drops of olive oil and vodka if using. I have got that Rachel Allen book (which I happily snapped up for the same price at my son’s pre-school book club!) and it’s excellent – I love her other book Bake but was sceptical I’d done the right thing buying this one as I also have Food for Living and have not been inspired by it at all. Anyway, gazpacho sounds very tempting in this warm weather we’ve been enjoying. Your photos look beautiful – I love the juxtaposition of the wet soup and that woven mat. Perfect. One of my favorite soups. I think the key to making good gazpacho is the tomatoes, if you buy regular tomatoes it doesn’t taste as good. If you have home grown sweet tomatoes it makes a huge difference, you probably don’t need the sugar. I have actually never added sugar in my gaspacho, does it turn out sweet? Beautiful!! 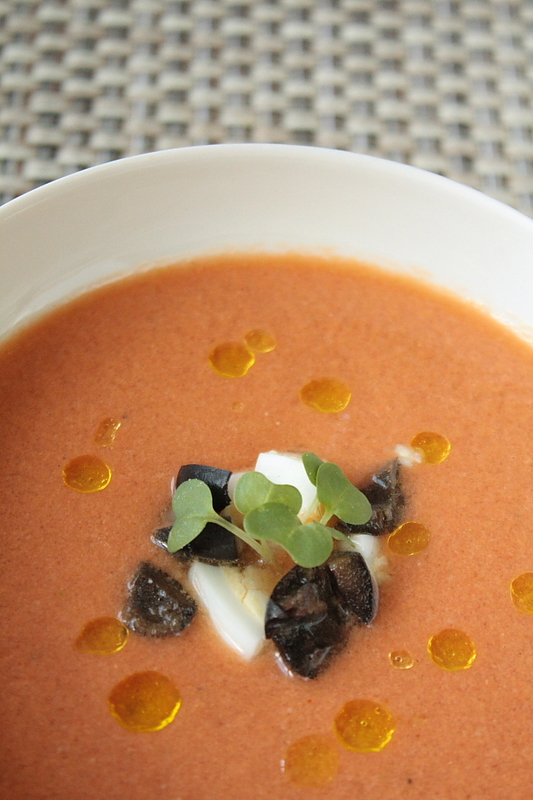 I love the color and gorgeous styling of your gazpacho! Isn’t it great summer recipe??? Have never made gazpacho either (and the weather has just turned here too, so I’ll have to wait for more sunshine until I try!) Must look out for that book too – haven’t seen it but I do have Rachel Allen’s ‘Bake’, which is lovely. I love gazpacho and yours look so pretty! We’ve already had gazpacho 5-6 times this summer, and we will probably have at least 5 times more. I agree that it’s perfect when it’s warm outside and you don’t feel like eating heave dinners. 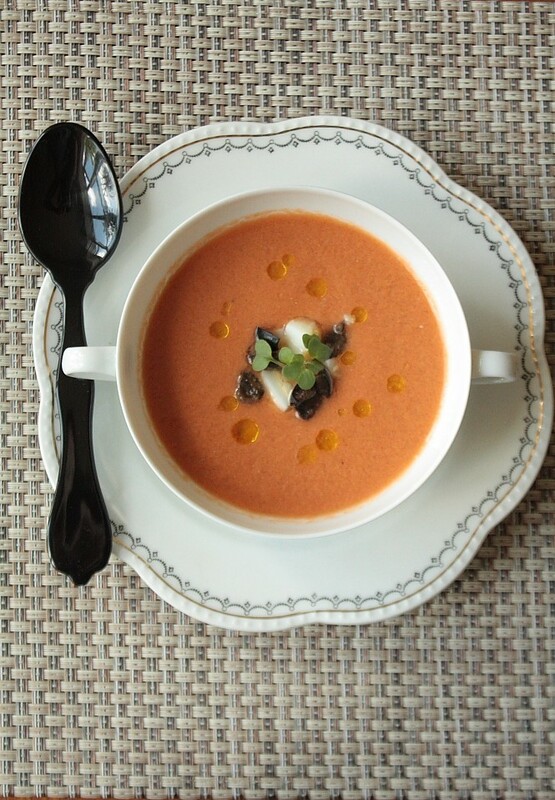 We will also try to post a recipe of our gazpacho (with watermelon) sometimes this week. 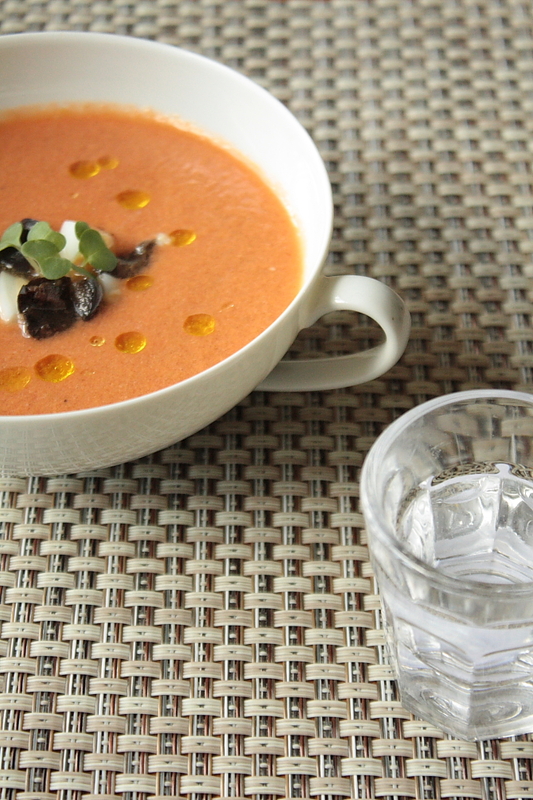 what a perfect summer soup……your gazpacho looks delicious! 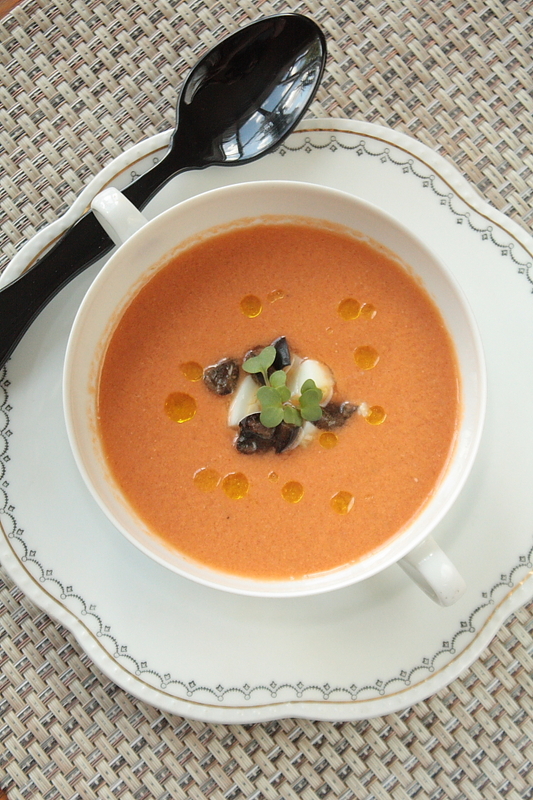 those glorious fresh tomatoes are perfect for this wonderful soup! Beautiful pictures and the color of the gazpacho looks so tasty. 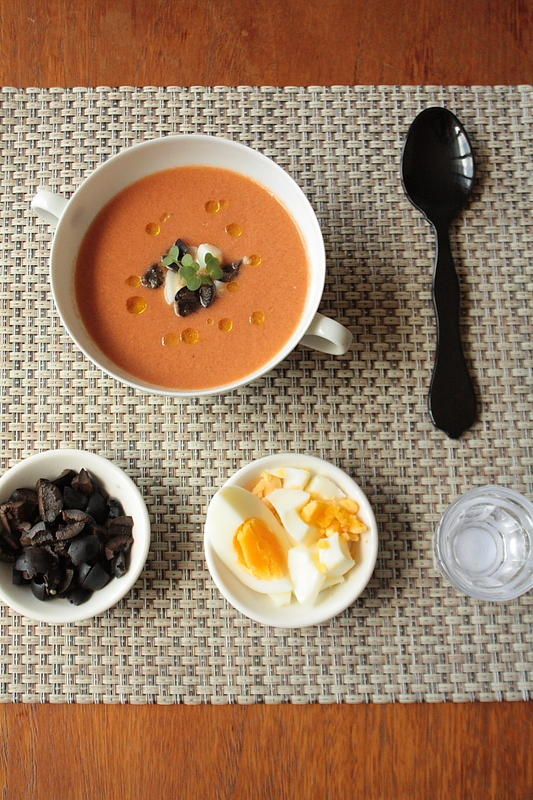 I’ve never had hard boil eggs with gazpacho, but love the idea. Bit warmer and sunnier today, fingers crossed that means the English summer is staying just a bit longer. ps Have you tried bibimbap at Bibimbap in Soho? Anne,I love gazpacho.it reminds me of lovely meals during summer time in Spain.it is the greatest summer dish in my opinion.delicious, full of flavours and light.I would have loved to have tasted yours.